Cancer cases are sharply rising among younger Americans. An alarming new study sheds light on why. This is very unfortunate news. Researchers looked at 30 of the most common cancer types. 12 of them were obesity-related. Of those 12, six types have risen in younger people. Obesity has been on the rise not just here in America, but around the world. And now adults between the ages of 25 and 49 here in the US are being diagnosed more often with potentially deadly diseases that are associated with obesity. (WXYZ) — Cancer cases are sharply rising among younger Americans. An alarming new study sheds light on why. This is very unfortunate news. Researchers looked at 30 of the most common cancer types. 12 of them were obesity-related. Of those 12, six types have risen in younger people. Obesity has been on the rise not just here in America, but around the world. 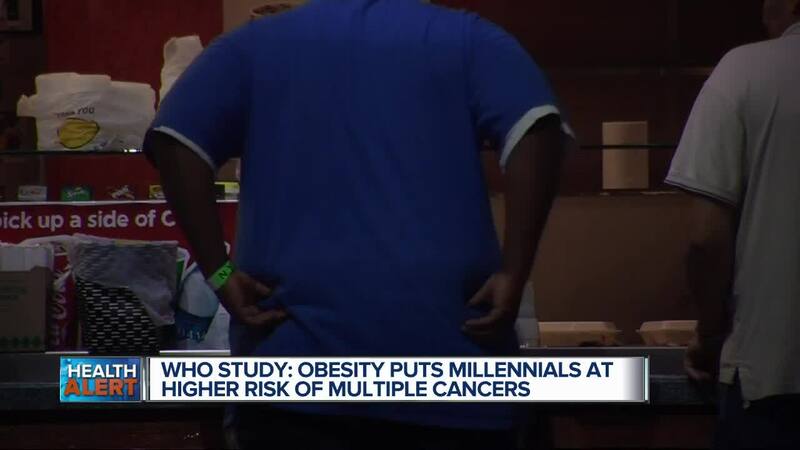 And now adults between the ages of 25 and 49 here in the US are being diagnosed more often with potentially deadly diseases that are associated with obesity. The report from the American Cancer Society and the National Cancer Institute said that by 2014, obesity accounted for 60% of endometrial cancers, 36% of gallbladder cancers, 33% of kidney cancers, 17% of pancreatic cancers and 11% of multiple myeloma. And that was among adults aged 30 and older. Unfortunately for millennials who are in their 20’s and 30’s, the risk of colorectal, uterine and gallbladder cancers has doubled compared to decades ago when baby boomers were the same age. 1. Losing weight and keeping it off means a lifestyle change. It has to be gradual and long-term so don’t even think about any of the trending diets out there. 2. Please learn about nutrition. It’s important to choose the right foods in addition to changing your thoughts towards eating. 3. Increase your physical activity. Just start by moving your body. Take short walks, dance in your home, but aim to do more as your stamina increases. 4. Make sure you have a strong support system. You need loved ones who can support you, especially when eating out, at parties or during traditional holiday meals. Also, it’s really important to talk to your doctor. He or she will do a wellness checkup and can recommend the best diet and exercise program based on your health condition. And if you drop weight and live a healthy lifestyle, this will transfer into a lower risk of cancers that are obesity-related. This week on The Dr. Nandi Show, “Diet is a Four-Letter Word for Failure”. We all know it can be very confusing when it comes to losing weight as there are so many different types of new diets and fads cropping up all the time. But the key is to create a realistic plan that makes healthy eating a way of life. So join Dr. Nandi this Sunday, Feb.10 at 1 p.m. And you’ll meet real people who have found a way to permanently lose weight through a healthy lifestyle change.